Who Do I Contact for Well Water Testing? Most ‘health’ issues stemming from contaminated well water did NOT have to happen so we really like hearing from people interested in getting their well water tested — hopefully BEFORE anyone has gotten sick from the water. Hello, Ilija, and thank you for your inquiry. When it comes to well water testing we suggest contacting a certified well water testing laboratory in your area. Your Local & State Health Departments should have a list that they can send. Please keep in mind that if you have reason to suspect well water contamination, you should always defer to the expert testing services of a qualified, certified water testing laboratory; preferably one in your immediate area since their staff will know more about the intricacies of your local water situation than a laboratory located in a different city, county or state. For spot testing of basic water quality parameters, test kits such as the WaterSafe Well Water Test Kit or SenSafe Water Quality Test Kit work quite well… but they do not test for more complex, man-made chemicals such as VOC’s (volatile organic compounds). If you want a more thorough analysis that includes things like pesticides and volatile organic compounds, you may want to take a look at test kit options like the National Testing Labs Mail-In Water Testing Kit that includes a number of commonly found pesticides and different VOC’s. We hope this has helped at least a little bit! Multistage Water Filter Plus Softener… Do They Make One? Thank you for your question Marquis and it sounds to us like you and your girlfriend have a real mess on your hands when it comes to the quality of your water. Question: Well water or city water? If well water, then we suggest looking in the phone book for a certified well contractor and having them come out to look at the condition of your well. If city water we suggest contacting your local water department and requesting the latest copy of their Consumer Confidence Report, an annually published document that discusses how good (or bad) a job the department did at keeping its water quality readings in line with Federal Guidelines. In either case, certainly get your water tested by a qualified water testing laboratory before investing – and yes, we said investing – in a water filtration and/or water conditioner for your home. Otherwise you may run the risk of purchasing the incorrect unit for your specific water remediation requirements. In other words you may buy the wrong tool for the job… and that could mean a whole lot of wasted money and continued water quality troubles. Definitely not cheap, but if you have drinking water in desperate need of improvement then investing in a whole house water filter & water softener system such as the Whole House Filter and Anti-Scale Conditioner Combo made by Crystal Quest may make sense. 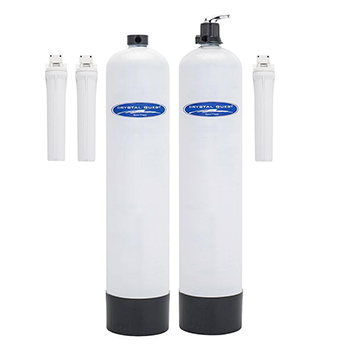 With pricing for the Whole House Filter and Anti-Scale Conditioner Combo (CQE-WH-02136) starting at around $2,900 you really, really, really want to make certain you 1) Need a water filter; 2) Need a water softener; 3) Know for sure that the unit will correct the specific water quality issues that you have. Not all water treatment options will work in every application so before you plop down your hard earned money, get your water tested by a qualified drinking water testing laboratory. If you cannot locate a local laboratory we suggest you consider using the testing services of an accredited mail-in water testing laboratory such as National Testing Labs.